Watch the discussion Wednesday's in downtown Portland about the 2019 version of the annual report. PORTLAND, Ore. — The 2019 Edelman Trust Barometer has shown a drop in trust toward societal institutions, governments and other authority figures. The annual report, which is conducted globally, has tracked steadily what people trust and how that has changed over time. The Portland event was led by Ben Boyd, Edelman's chief client strategy officer, and the moderator is Will Ludlam, general manager of the Edelman Pacific Northwest office. A panel included top leaders from companies such as Tillamook, New Seasons Market and Kaiser Permanente. The report examines global trends among 33,000 people from 27 countries. According to Edelman, "the last decade has seen a loss of faith in traditional authority figures and institutions, and more recently, a loss of confidence in the social platforms that foster peer-to-peer trust. This year, these forces have led people to shift their trust to the relations in their control, with "my employer" emerging as the most trusted institution." The report, "Globally, 75 percent of people trust “my employer” to do what is right, significantly more than NGOs (57 percent), business (56 percent) and media (47 percent)." It also found that more people are consuming, and sharing, news regularly, although a high number of people are concerned about "fake news" or false information being used to divide people. Social media was also found to be mistrusted, far below the level of trust for traditional media sources. "Despite the divergence in trust between the informed public and mass population the world is united on one front—all share an urgent desire for change. Only one in five feels that the system is working for them, with nearly half of the mass population believing that the system is failing them. In conjunction with pessimism and worry, there is a growing move toward engagement and action. 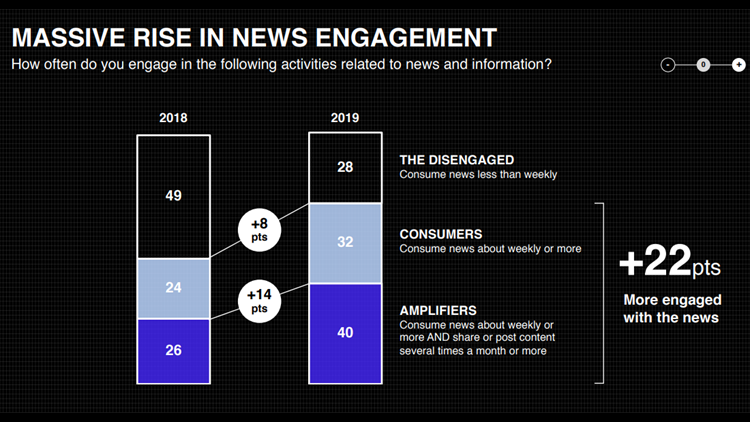 In 2019, engagement with the news surged by 22 points; 40 percent not only consume news once a week or more, but they also routinely amplify it. But people are encountering roadblocks in their quest for facts, with 73 percent worried about fake news being used as a weapon." For more on the full report, click here.